You wouldn’t know it by looking at these, but they were a labor of love. Not the recipe, per se; the recipe is actually very straightforward and requires two bowl, a spoon and a baking pan (you know how I love a simple recipe), but the concept. See, I made this recipe in honor of someone pretty darn special: my friend Meriem. When I was planning my wedding, Meriem was my one-woman cheerleading squad. When I was tired and overwhelmed with details, Meriem reminded me that even the tiniest details were important and were one step closer to marrying a pretty awesome guy. She even organized the stealthest of stealth virtual bridal showers (seriously, I had NO idea) and totally knocked my socks off. What can I say? The woman loves weddings. And now, she gets to plan her own! Next month, Meriem is marrying an amazing man, and the minute I heard, I immediately started covertly planning the virtual bridal shower I had been dying to throw her ever since she surprised me with mine. The two of them (I’m withholding her fiance’s name since I’m not sure where he stands on the whole put-your-life-on-the-internet thing…) are so happy together, so great together, so well-matched, that they are just like this dessert: take one beloved flavor – dense, rich, chocolatey-to-the-end brownies – and pair it with another awesome flavor – soft, sweet dough studded with chewy chocolate chips – and you get something that is so much more than the sum of its parts. From my first bite – and this is no exaggeration – I said to myself “this is the best thing I have ever baked”. And that’s saying something, given how many baked goods come out of my kitchen on a weekly basis. Then I ate 2 more and had to quickly hide the pan from myself so that I didn’t make myself sick (um, yeah. They’re RICH). So, do yourself a favor and make these when you have friends over or an especially strong wave of self control comes over you. Sometimes the best recipes are the hardest to write about because, quite frankly, they defy words. 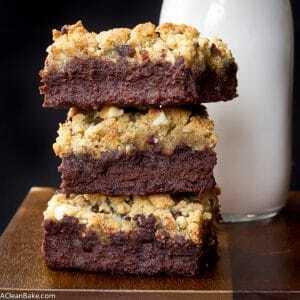 I could say these are decadent, rich, intensely chocolatey, and melt in your mouth. But how many times have you heard a dessert described in some variation of those terms? A million, I”m sure. No, words won’t do here. It’s nothing but the best, most description-defying treats for my friend Meriem, so I guess you’ll just have to try these for yourself to see what all of this fuss is about. 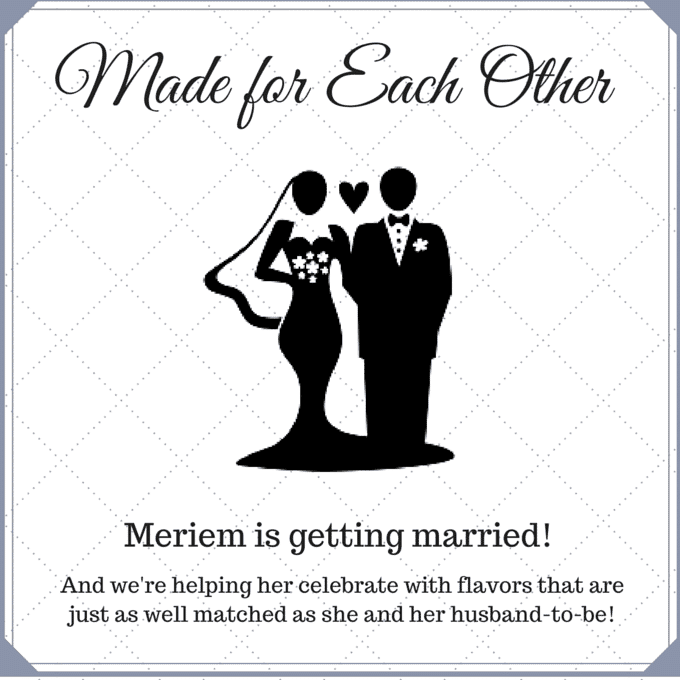 And while you’re at it, make sure you scroll down to check out all of the other treats that pair “made for each other” flavors to celebrate Meriem and her husband-to-be! Preheat the oven to 350F. Spray or grease an 11"x7" oven safe pan and set aside. 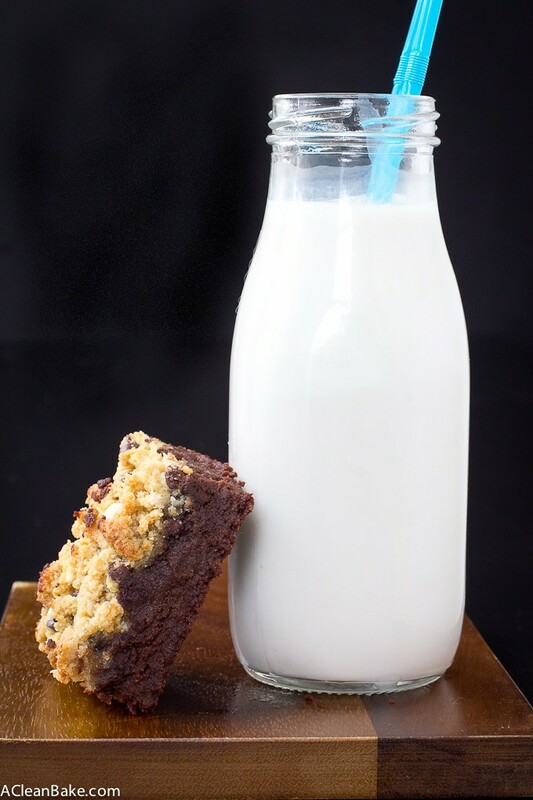 Prepare the brownie layer: in a large, microwave-safe bowl, or in a double boiler, melt the chocolate chips and coconut oil or butter. Stir to combine and cool slightly, so that you can hold your finger in the chocolate for 5 seconds comfortably. Stir in the egg, yolk, vanilla, and applesauce. In a separate bowl, whisk together the almond flour, cocoa powder, sweetener, and salt. Pour the dry ingredients into the wet ingredients and stir to combine. Transfer the brownie layer into the prepared pan and smooth into an even layer. Set aside. Make the cookie layer: In a large bowl, whisk together the almond flour, coconut flour, sweetener, baking soda, and salt and set aside. In a separate bowl, whisk the egg, then whisk in the honey or maple syrup and the coconut oil. Pour the wet mixture into the dry mixture and stir to combine. Then, fold in the chocolate chips. Use your (clean!) hands to sprinkle the chocolate chip cookie mixture, which will be crumbly, in an even layer over the brownie batter. Pat it down very gently. If you want a more solid layer, you can flatten it more. Make sure you're covering the brownie batter evenly, and getting both batters into the corners of the pan so that it will bake evenly. Bake for 25 minutes until the edges of the cookie dough start to become golden, then place a piece of tinfoil over the top of the pan and bake for an additional 15-20 minutes, or until a tester comes out mostly clean (there will be a bit of brownie residue on it, but that's ok). Cool completely before slicing into bars. For easiest slicing, chill the entire pan in the fridge. I used mini chocolate chips, but if regular size chocolate chips are all you have on hand, feel free to use them. I also used some white chocolate chips - because this is for a wedding shower! - but you certainly don't have to. Just use what you have on hand. If you only have an 8"x8" pan, you can use that instead, but your bars are going to be thicker and need additional baking time. oh my gosh, these look not real. 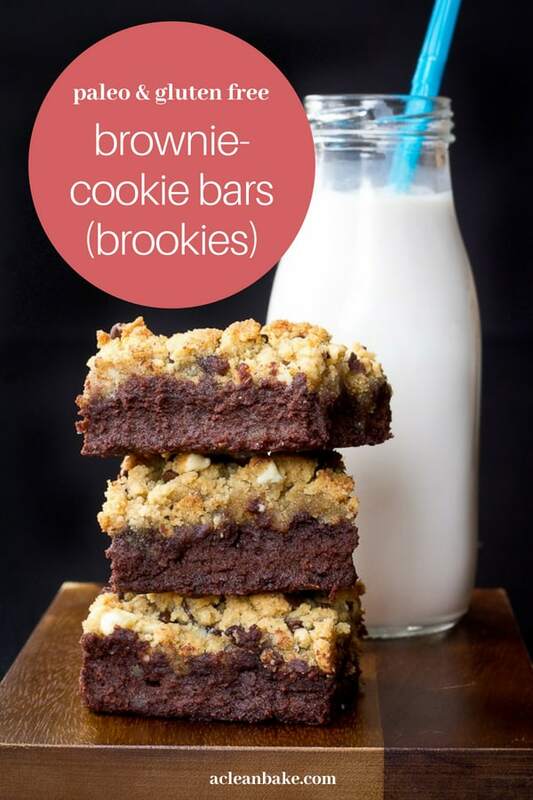 also i love the name brookies!!! 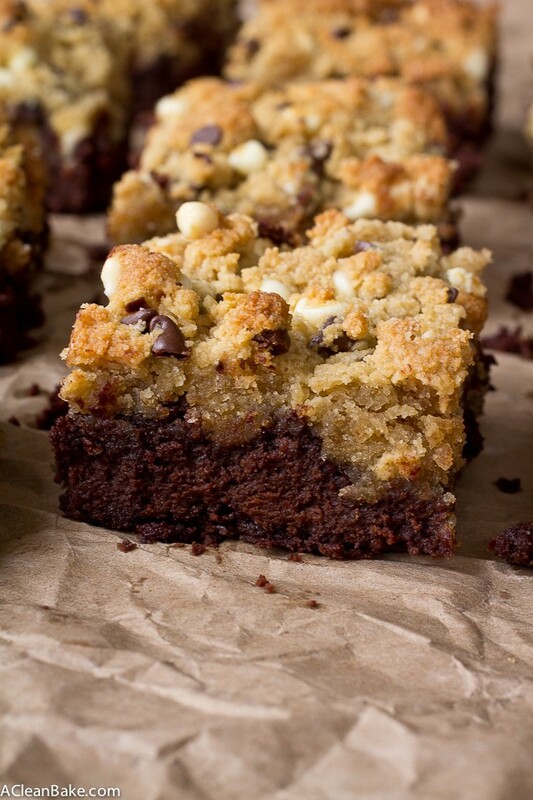 my favorite ice cream flavor is brownie cookie dough haha, so i love that you combined the two into one baked good. My dear Nora!!! Just like no words are able to describe the awesomeness of these brookies, no words are able to express my emotions waking up this morning to this shower and furthermore, reading through this post! Seriously, you have left me speechless and on the edge of tears–happy tears that is! Thank you so much for being the best blogging bestie! 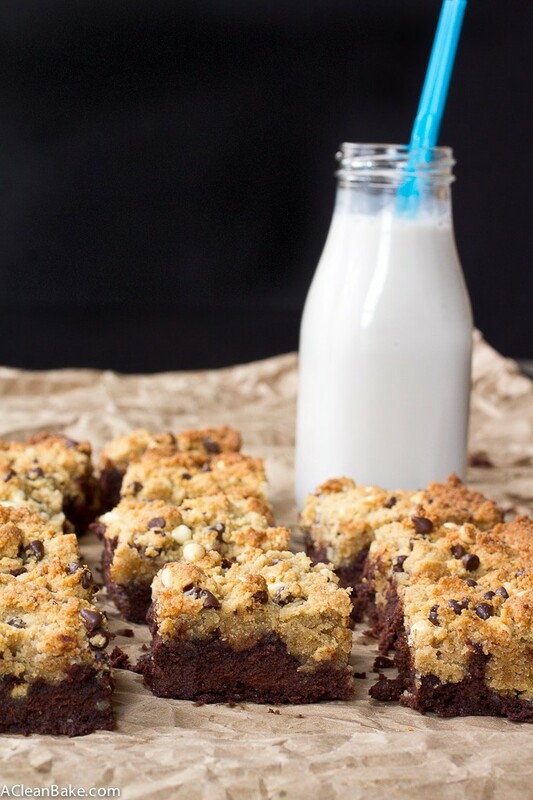 <333333 Now I'm off to make these brookies STAT! 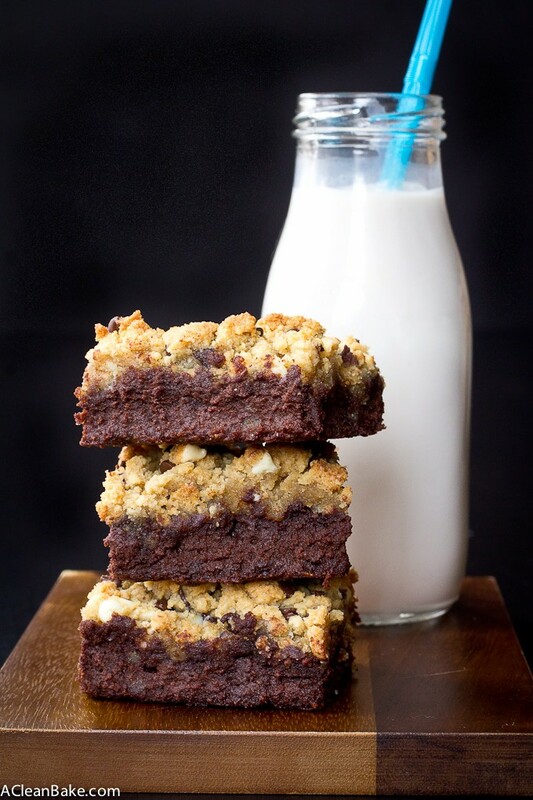 Just when I thought I loved brownies a lot, I saw this recipe and everything changed! That cookie topping has got me drooooollllingggg! How much vanilla and applesauce in the brownie layer? They are not listed in the ingredients. I’m so glad you caught that! Sometimes the recipe card software highlights and types over lines. Ack. It is fixed now, but to answer your question: 1/2 tsp vanilla extract and 1/2 cup no-sugar-added applesauce. Sorry for the mix up and thanks for bringing it to my attention! I’m so sorry I missed these earlier! They look fabulous and how sweet of you to throw a virtual shower! If I want to do this recipe vegan, how can I sub the egg and egg yolk? I normally use applesauce. Hi Vivian! Great question. I would recommend using 1.5 flax eggs, but I haven’t tried this for sure. If applesauce usually works for you, you can feel free to use that instead (about 4-6 Tablespoons). Either way, you will have to increase the baking time to account for the extra moisture you’ll be adding, so don’t be surprised if the bars are still very soft and soupy after 45 minutes. That’s normal! Let me know how it goes! Hi – these look smashing! I wanted to try them, but didn’t know if you found a chocolate chip with no sugar added, so it’s Paleo-compliant, or do you ever make your own chips? Can’t wait to try this recipe! Thanks! Hi Katy! I wouldn’t recommend using your own chips for this one (Although for future reference I do have a homemade sugar free chocolate recipe on my site), but the Lily’s sugar free chips, available here, would be a good sugar free alternative. I usually use the darkest/lowest-sugar chips I can find, but they do contain a bit of sugar. I hope this helps!